In this blog entry, I intend to outline some of the most common criticisms and concerns regarding Flex that I hear or read from other developers. Because Flex necessarily compiles to Flash, any Flash criticisms or disadvantages are also Flex criticisms or disadvantages. I will first list some of the most common criticisms and disadvantages correctly or incorrectly associated with Flex (and Flash) and then provide brief detail on things that address these issues. I welcome feedback in the comments section on any criticisms or disadvantages that I have missed and any events or methods that reduce the disadvantage or criticism. For a long-time, one of the most significant criticisms of Flex that prevented developers from adopting it was its licensing costs. In fact, in his now well-known article Hybridizing Java, Bruce Eckel (a well-known Flex evangelist featured in Adobe advertisements for a while) even states that Flex's former licensing costs affected how much he used and wrote about Flex. This movement started with Flex being released for free use outside of commercial products and then moved to a fully free Flex SDK. I still occasionally see developers stating in blogs or on comments on blogs that they won't use Flex because of its licensing costs, but for much of Flex this is simply not the case anymore. There are some "extra" Flex features that still do require license fees for commercial use, but Flex applications can be written without these. While there are advantages to a product, library, or framework being open source, calling something open source does not necessarily make it better than competing alternatives (witness all the dead open source projects out there) and does not necessarily make it free of cost (free speech versus free beer). Still, there are a growing number of developers who desire "open source" as one of the most significant characteristics of the products and frameworks they choose. For them and even for those of us who prefer open source when it is competitive in other aspects as well, it was good news when Adobe announced the open sourcing of Flex. Major components of Flex 3 (SDK, debugger, etc.) were released as open source. Shortly before Flex 3's release, Adobe also released BlazeDS (especially useful for Flex-to-Java communication) as open source. There are optional portions of Flex that are still not open source and/or still require licensing fees, but these are not necessary to create fully functioning Flex-based applications. As part of the RIA experience, Flex-based applications tend to load more than DHTML applications initially, but then often have reduced reloading and server communication after the initial load. However, this means that a Flex-based RIA can often take longer to load initially than a DHTML-based RIA. Adobe continues to work on improving the performance of the Flash Player to reduce this disadvantage. The relatively recent announcement of the new Flash Player Caching is very welcome in this area. There are several tactics Flex developers can take as well to reduce the initial load time. For example, the Flex TabNavigator has a creationPolicy attribute that allows all tabs in the navigator to be loaded at load time (ContainerCreationPolicy.ALL) or have only the initially visible tab loaded (deferred instantiation with ContainerCreationPolicy.AUTO). Links to other ideas for improved Flex performance are available in the article Flex RIA Performance Considerations Part 1: Getting Started. Part 2 in this same series focuses on application startup. Another early criticism of Flex was the lack of IDE and tooling support that Java enjoys. This, of course, is just as deserved and just as common complaint for many other highly useful languages as well. However, Adobe has released FlexBuilder, an Eclipse-based Flex IDE. While Adobe does charge a licensing fee for FlexBuilder and while FlexBuilder (like most IDEs) does have room for improvement, it is also true that FlexBuilder comes with many nice features for making Flex development more productive. Because it is Eclipse-based, it is fairly easy for Java developers familiar with Eclipse to learn and use. The author of the entry Flex 3 Vs Silverlight and JavaFX - Is Adobe Listening? maintains that Flex "may die on the vine" because it charges for FlexBuilder. As outlined above, the making Flex itself available for free did undoubtedly help increase its adoption, but the cost difference is significant. Flex formerly had license fees costing thousands of dollars while FlexBuilder fees are measured in hundreds of dollars. Still, many IDE vendors do offer free IDEs already (Eclipse, NetBeans, and JDeveloper for example). While I agree the licensing fee required for FlexBuilder must have some impact on Flex's adoption rate, I'm not convinced that it has been or will be as great on the long-term adopters of Flex as maintained in this entry. For those who don't want to purchase FlexBuilder, there are some alternatives. Because both MXML and ActionScript are text-based, even a simple text editor will work at a minimum level of functionality. Because Flex MXML is an XML grammar, any XML-aware tool can be used to provide some advantages to working with MXML. For example, I have blogged previously about using NetBeans XML support and JEdit's XML support with Flex. One can go even beyond simple XML handling with more specific editors like Spket IDE and Aptana. Some developers have had such negative experiences with Flash-based applications that they have a hard time even considering Flash (and hence Flex) for their web applications. There are many reasons for this resistance to the Flash Player, including wanting to avoid a proprietary runtime and not liking Flash application experiences in others' applications. The latter point can be partially addressed by considering that just because someone else abuses a language or framework doesn't many I need to. If that was the case, no language or framework would be acceptable because they all get abused by someone. Related to the proprietary nature of Flash, there are some mitigating conditions to consider. The OpenScreen Project was huge news for Flash running on devices because it is intended to remove restrictions on two major Flash-related specifications (SWF and FLV/F4V) and to remove license fees for both AIR and Flash Player. Another interesting development occurred when Adobe and Mozilla partnered in the Tamarin Project to include the ActionScript Virtual Machine (AVM). While the Flash Player is nearly universally available in 32-bit architectures, it is not available for 64-bit architectures. This has been a particularly loud complaint from Linux users, though Microsoft Vista developers are starting to request a 64-bit Flash Player more actively as well. This concern can be partially addressed by running the 32-bit Flash Player on the platform, such as on a 32-bit browser running on the platform. In Flash 9 on 64-bit Linux in 2 Commands, James Ward covers how to use the Flash Player on 64-bit Linux. Likewise, Darron Schall has written about running Flash Player on 64-bit Linux platform in Installing Flash Player 9 on 64-bit Linux. Interestingly, James Ward points out in Where is 64-bit Linux Support for Flash Player? that one of the major hold-ups on a 64-bit Linux Flash Player is the need to upgrade the Tamarin project discussed briefly in the criticism above. UPDATE (24 November 2008): Adobe has announced the release of an alpha version of Flash Player 10 for 64-bit Linux. An excellent review of life in Linux without this release is available in Adobe Starts 64-bit Flash Testing with Linux Alpha. The excitement in the Linux community over this is documented in One More Reason for Linux Lovers to Give Thanks. A common complaint about Flex-based RIAs that is really common to even many Ajax-based RIAs is the inability or difficultly involved in letting web users use meaningful URLs in histories and bookmarks. This was easy and expected in static web pages and even in more dynamic web sites that completely reloaded the page after each server request. With Ajax and Flash-based RIAs, these things are not quite so easy now. Just as many of the Ajax/DHTML frameworks have begun to provide support to ease the developer's ability to allow users to use URLs for bookmarking and histories, similar approaches have sprung up for Flex. However, the really good news was Flex 3's support for BrowserManager and deep linking. Approaches of use in this area (including the Flex 3 BrowserManager to perform deep linking) are covered in Flex 3 Features: Deep Linking in Flex 3, Flex 3 BrowserManager, and Flex 2 Applications and Bookmarking 101. Deep linking only works on select browsers (the most significantly used ones though) and takes a little extra effort, but does provide benefits associated with changing URLs in a web application. Another commonly discussed disadvantage of the Flash Player is the inability of search engines to index the binary content of a Flash application. A command work-around has been to developer HTML "wrapper" pages for the SWF applications that includes terms that the search engines can find. This tried and proven method works, but there are even more advancements coming. Google, Yahoo!, and Adobe have announced their combined effort to better index the text content in Flash applications. Considering the dominance of Google and Yahoo! in the search engine business, this is a big deal. In addition, it sounds like this approach will be made available to other search engines in the future if it works out well. Some of have questioned Adobe's commitment to Flex, especially in light of Adobe's early interest in SVG (Scalable Vector Graphics) followed by seemingly significantly reduced interest in SVG. While I don't work for Adobe and have no knowledge of what they may or may not do, I don't worry much about this particular criticism because Adobe's products still continue to support SVG to a large degree. More importantly, however, it appears to me as an outsider that Adobe has placed significantly more emphasis, time, and resources into Flex. Also, it is only anecdotal observations, but it seems to me that Flex is gaining popularity much more rapidly than SVG did. This is not too surprising because, as much as I like SVG, Flex is in many ways appealing to a wider audience of developers than SVG. The fact that Microsoft and Sun are trying to match Flex with their Silverlight and JavaFX products respectively demonstrates to me that all three of these major players believe there is a future in the RIA application development business. For a series of articles spelling out obstacles and competitive forces that Adobe faces with Flex, see the three-part series Flash Wars. I won't write much about this here because Matthew Fabb's blog entry Multi-threading is Coming (Sort of) to Flash Player 10 does such a great job of articulating (based on his attendance at Jim Corbett's Flash Player Internals presentation at FITC) the issue and good news in that area. He describes how Flash's single-threaded architecture can be a limitation in Flash-based (and hence Flex-based) applications and how Flash Player 10 will be providing some multi-threading support. I saved the common criticism that I think is most overblown for last. Flex is based on the W3C standard XML specification (for Flex's MXML) and the envisioned ECMAScript standard [ECMA-262 Edition 4] (for Flex's ActionScript 3.0), including support for E4X (ECMAScript for XML). In this blog entry, I've attempted to outline common criticisms and cited disadvantages of Flex (and Flash). Some of these were valid but have been overcome by events. Others are still valid, but most of them have been at least partially addressed with modern advances in Flex and Flash. I like forward to additional concerns being addressed in future releases of Flex and Flash. I also encourage you to add any other drawbacks or criticism you have from using Flex and Flash in the feedback section along with any approaches you may have used to overcome one of the drawbacks listed here or in the feedback section. Thanks in advance for your input. * Is Flash Good or Bad? In previous blog entries, I demonstrated coding Model MBeans directly (“in the raw”) and using the Spring Framework. In both cases, two primary advantages of Model MBeans (highly descriptive nature and ability to present non-JMX objects as managed JMX resources) were realized. While writing the Java code to construct Model MBean metadata information is not difficult, it is tedious. The Spring Framework significantly eases this effort, but requires a dependency on Spring if the full descriptive nature of the Model MBean is to be realized via Spring’s JMX metadata annotations. For those who want rich descriptions of their Model MBeans, who want to reduce the Java code required to implement Model MBean metadata, and cannot or do not want a Spring dependency, the Apache Commons Modeler may be the appropriate answer. As its name implies, the Apache Commons Modeler is part of the highly useful and varied Apache Commons project. For this blog entry, I am using Modeler 2.0.1. The Modeler 2.0.1 download includes a JAR file (commons-modeler-2.0.1.jar) and the XML DTD for Modeler XML metadata configuration files (mbeans-descriptors.dtd). The contents of this DTD can be viewed without downloading Modeler at the URL http://jakarta.apache.org/commons/dtds/mbeans-descriptors.dtd. I’ll be demonstrating how to register the same SimpleCalculator class as a Model MBean that was used in the previous blog entries with direct Model MBean creation and Spring-based Model MBean creation. For convenience, the SimpleCalculator class is reproduced here. 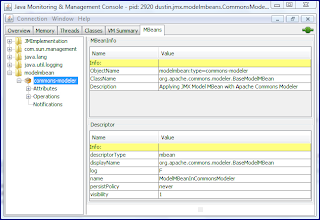 * of JMX or management can be "wrapped" with ModelMBeans. * Calculate the sum of the augend and the addend. * @param augend First integer to be added. * @param addend Second integer to be added. * @return Sum of augend and addend. * Calculate the difference between the minuend and subtrahend. * @param minuend Minuend in subtraction operation. * @param subtrahend Subtrahend in subtraction operation. * @return Difference of minuend and subtrahend. * Calculate the product of the two provided factors. * @param factor1 First integer factor. * @param factor2 Second integer factor. * @return Product of provided factors. * Calculate the quotient of the dividend divided by the divisor. * @param dividend Integer dividend. * @param divisor Integer divisor. * @return Quotient of dividend divided by divisor. When using Apache Commons Modeler, most of the work is done in an XML metadata configuration file conforming to the DTD specified above. For this example, that XML file is shown next. The XML element and attribute names are largely self-explanatory and additional information on these can be found within the DTD definition at http://jakarta.apache.org/commons/dtds/mbeans-descriptors.dtd. description="Applying JMX Model MBean with Apache Commons Modeler"
description="The first parameter in the addition (augend)." description="The second parameter in the addition (addend)." description="The first parameter in the substraction (minuend)." description="The second parameter in the subtraction (subtrahend)." description="The first factor in the multiplication." description="The second factor in the multiplication." description="The dividend in the division." description="The divisor in the division." 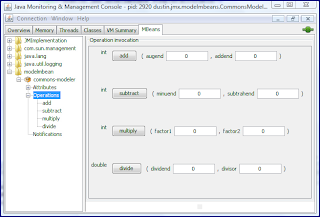 My SimpleCalculator-based JMX Model MBeans examples (direct, Spring-based, and now Commons Modeler-based) have all focused on specifying MBean operations and their parameters. 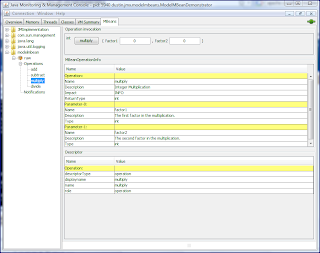 To see how to specify other portions of a Model MBean with Commons Modeler, see the "Modeler" section of the article Using Jakarta Commons, Part 2. Note that there have been a few changes since that article was written. The promotion of the Commons project from a sub-project of Apache Jakarta to its own Apache Commons project brought the name change and is a relatively minor change. However, several changes to the API have led to some of the methods used in previous examples being deprecated. The next class is the main class that reads in the XML metadata configuration file and uses Modeler to register an MBean with the descriptive information provided in the XML file shown earlier. Note that this code explicitly looks up the XML file by name. I could have had Modeler pick up the metadata configuration implicitly by appropriately naming the XML file and including it in the same package as the code, but I chose to use the explicit loading for this example. * register a Model MBean with the Platform MBean Server. // which must be captured here..
"ERROR trying to load metadata into Commons Modeler Registry "
+ "from configuration file " + modelerMetadataFile + ":\n"
System.err.print(  "ERROR trying to access metadata file "
* Pause for the specified number of milliseconds. * @param millisecondsToPause Milliseconds to pause execution. * @param arguments Command-line arguments. The following three screen snapshots demonstrate how the results look in JConsole. 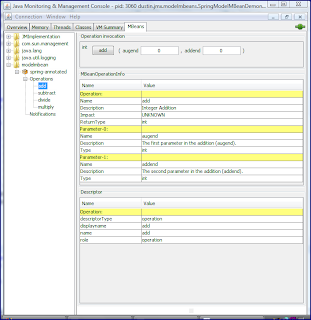 As the above example has demonstrated, Apache Commons Modeler allows JMX Model MBean metadata to be shifted from hard-coded Java into external XML configuration files. Whether this is an advantage or not is dependent on the situation and developer preferences (some prefer Java coding over XML even for configuration like this). However, it is nice to have an alternative available for those who prefer their Model MBean metadata to be externally configurable. For additional information on Apache Commons Modeler, see the project’s home page and the previously referenced article Using Jakarta Commons, Part 2. One of the most useful resources for learning to apply Apache Commons Modeler is the Javadoc API documentation for the package org.apache.commons.modeler. This Javadoc-generated documentation is included with the Modeler download and the description for package org.apache.commons.modeler is highly useful in explaining how to use Modeler. Among other interesting pointers, this description specifies how to have Modeler XML configuration found implicitly, how to use manual Java MBean metadata application rather than XML configuration, and which methods of the Modeler API are now preferred and which are now deprecated ("strongly" in some cases). In the creatively named blog entry The JMX Model MBean, I demonstrated with a simple example how the JMX Model MBean enables greater descriptive ability than is available with other JMX MBean types. The simple example also demonstrated that a Model MBean can be applied to an existing class with no knowledge of JMX and without any awareness that it is being exposed via a JMX management and monitoring interface. The one major drawback of Model MBeans that even this simple example demonstrated is the tedious and verbose code needed to build a Model MBean without aid of other tools or frameworks. In that blog entry, I called out some approaches that can aid in the development of Model MBeans. These include Spring Framework’s JMX support, The Apache Commons Modeler approach, JBoss’s XMBeans, and the use of reflection. 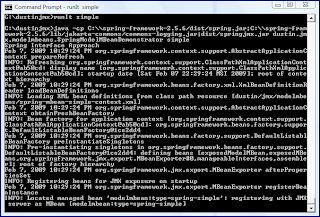 In this current blog entry, I will delve into Spring Framework’s support for Model MBeans in greater detail and demonstrate how easy Spring makes it to apply JMX Model MBeans. By default, Spring’s support for JMX relies upon Model MBeans (though the developer has no need to deal with Model MBeans directly). The reason for this seems clear – the Model MBean allows normal Java classes with no JMX knowledge or awareness to be exposed via a JMX interface. This approach fits Spring’s behavior in other areas. In other words, it seems to be "the Spring way" to use plain Java classes with little or no knowledge of their surroundings and then "wire" them up to their surroundings via external configuration. In this blog entry, I’ll demonstrate how Spring enables Java classes with absolutely no Spring or JMX awareness to be exposed via a JMX interface and how just a little tinkering with the plain Java class via annotations enables the full descriptive power of Model MBeans to be deployed. Although the JMX Specification (Chapter 4) talks about other potentially useful features of the Model MBean (such as persistence described in section 4.3.4), the two options of the ModelMBean that I most often take advantage of are the Model MBean’s descriptive support and the ability of the Model MBean to expose a non-JMX class in a JMX agent. In Spring, it is almost trivial to obtain this first benefit and expose a class with no awareness of JMX (or even of Spring) as a manageable and monitorable resource. In fact, the "code" needed to do this lies completely in Spring configuration. The following Java code listing contains the class (SimpleCalculator) that has no JMX awareness, but will be exposed via Spring as JMX-accessible. The XML code listing following SimpleCalculator.java shows how Spring is instructed to expose SimpleCalculator as a JMX-accessible resource. The SimpleCalculator class shown above is essentially the same class used in my previous blog entry on Model MBeans done without benefit of Spring. This is far less code than needed in my example of employing Model MBeans without the Spring Framework, but the one disadvantage is that the greater descriptive ability of the Model MBean is not enjoyed in this simple example. 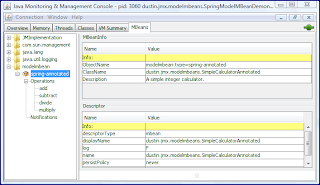 This is demonstrated in the following three screen snapshots of JConsole viewing this simple Spring-exposed Model MBean. The Spring Framework provides a mechanism to provide greater descriptive information to our Spring-exposed Model MBeans. This is done via Spring-specific annotations. The downside of this approach is that the otherwise JMX-unaware and Spring-unaware classes now dependent on Spring-specific JMX-related annotations. However, the benefit of this is great descriptive ability with relative coding ease. The next code listing shows the adapted SimpleCalculatorAnnotated class that is the same class as SimpleCalculator, but with the Spring JMX annotations. The XML needed to configure this class to be exposed via Spring is then shown as well. * Spring also supports use of Apache Commons Attributes for metadata specification. The next three screen snapshots show via screen captures of JConsole how the Spring annotations have allowed the annotated class to provide greater descriptive details to the JMX client. The annotations are far less verbose and are arguably easier to write and maintain than the code I showed in the Model MBean blog entry in which I did not use Spring. If it is overly burdensome or undesirable to add these annotations to the source class, one can "wrap" the source class with a class that has these annotations. An example of this is shown next. The SimpleCalculatorWrapper class "wraps" the SimpleCalculator class. In this approach, SimpleCalculatorWrapper must know about Spring and Spring’s JMX annotations, but the original SimpleCalculator does not need to be specific to Spring or to JMX. * Setter method to set the object that I "wrap." * @param calculator SimpleCalculator that I should wrap. I won’t show the JConsole view of the wrapper because it appears nearly the same as what was shown for the directly annotated class. The only difference is that the original SimpleCalculator is left untouched by Spring-specific JMX annotations because the wrapper class shields these details from the SimpleCalculator class. In the annotations examples above, I used the standard Java SE type annotations to provide the JMX Model MBean metadata. Spring also supports using Apache Commons Attributes for this. The Spring approach of specifying JMX ModelMBean metadata via annotations has proven so popular that it now sounds like JMX 2 is very likely to include similar, or at least Spring-inspired, annotation support. The obvious benefit of this would be the ability to enjoy highly descriptive Model MBeans without all the code even when not using Spring. For completeness, I am including the main Java class that instantiated my three Spring-related examples above: SimpleCalculator without annotations, SimpleCalculator with annotations, and a "wrapped" SimpleCalculator. * The purpose of this class is to demonstrate use of ModelMBeans with Spring. I also added an interface, SimpleCalculatorIf, to these examples to make them easily accessible via the same code for any of the three approaches covered in this blog entry. That simple interface listing is shown next. * Interface to expose Model MBean via Spring. Spring makes use of JMX easier in general. Because Spring uses Model MBeans anyway for its JMX support, it is easy to apply the descriptive power of the Model MBean to one’s Spring-exposed JMX MBeans using annotations. See the blog entry Adding Information to a Standard MBean Interface Using Annotations for a method of using annotations processing to provide descriptive detail via Standard MBeans (as opposed to Model MBeans). UPDATE (7 February 2009): The following section has been added in response to a request in the feedback section. This section demonstrates how to build and run the code examples shown earlier in the blog post. 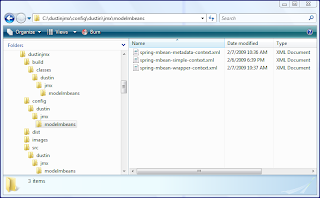 The Java source files and XML configuration files for Spring shown above can be placed in different locations depending on how the build file is set up. I will provide an Ant build.xml file that generates a JAR file and a script for running the examples. This build file depends on the Java source code files and Spring Framework configuration files being in a directory structure as shown in the next two screen snapshots. As the screen snapshots above demonstrate, I placed the directories and files under a root directory called C:\dustinjmx. The src and config subdirectories hold the Java source code files and Spring XML configuration files respectively. With this structure in place, the following Ant build.xml file can be used to compile the Java source code and assemble a JAR file. This build file also optionally generates a script that can be used to run the Java/Spring examples. description="Generate script to run JMX examples"
description="Generate run script for Windows"
description="Generate run script for Linux." The location of the Spring Framework should be changed in the build file to point to wherever it is located on the individual machine. The generate-run-scripts target can be called with ant generate-run-scripts to build a script that can then be run to start the examples covered earlier in this blog posting. When the script is run, it should be run with a command-line option of simple, wrapper, or metadata like this: runIt simple. Once this script has been started, JConsole can be started in a different window by typing "jconsole" on the command line. 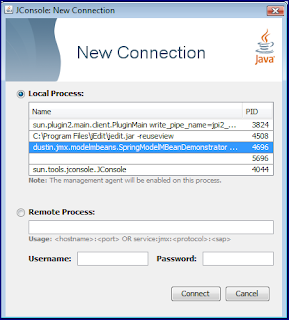 If JConsole is run on the same machine as the Java application just started, the it should be a local connection that can be selected as shown in the following screen snapshot. 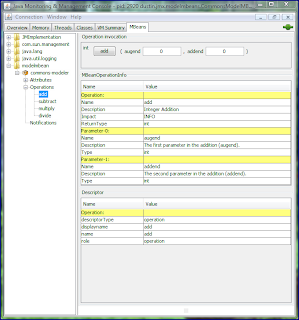 Use the MBeans tab to interact with the Java application as shown earlier. The OpenLaszlo blog has an entry today called OpenLaszlo 4.1.1 Now Available in which it is recommended that anyone who downloaded OpenLaszlo 4.1 "upgrade to release 4.1.1." The blog entry also includes a link to a list of bug fixes in 4.1.1. The OpenLaszlo 4.1.1 Reference is available here and OpenLaszlo 4.1.1 itself can be downloaded here. Other good news on the OpenLaszlo front is renewed talk about a Laszlo Systems-provided Eclipse-based IDE for OpenLaszlo. UPDATE (14 July 2008): I am updating this blog entry (striking out certain text and adding other text) to be more accurate in light of Henry's reminder (see comments) about an important part of the migration to OpenLaszlo 4.1. As part of this update, I also added "NOT" to the blog entry's title. As I was adding tool tips to the OpenLaszlo RSS Reader that I blogged about earlier, I noticed that the hyperlinks to blog entries no longer worked. 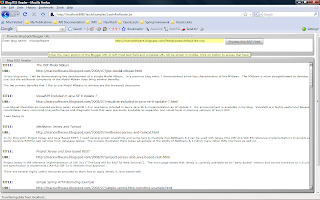 I turned on the Laszlo debugger and the reason for the absence of hyperlinks in my RSS Reader was made evident as shown in the following screen snapshot (click on image to see larger version). The debugger shows by the comment "call to undefined function textformat" that something had happened to the textformat object I was previously using. All of the other debugger output is directly due to this not being found. I confirmed that there is no textformat file in my OpenLaszlo 4.1 installation directory despite it still being listed in the OpenLaszlo 4.1 LZX Reference Manual and being discussed in Chapter 22 of the OpenLaszlo 4.1 Application Developers Guide. The code that was now leading to the debugger output error messages is highlighted above. As Henry points out in the comments to my original version of this blog entry, and as documented in the OpenLaszlo 4.1 Release Notes (see section "Upgrading to OpenLaszlo 4.1"), "user classes are no longer defined as part of the global namespace" and are now instead specified with lz. in front of the user-defined class. Apparently, textformat (or lz.textformat now) fits this description. The next code listing shows the simple addition of lz. in front of textformat. This was enough to fix the debugger warnings and make the hyperlinks work again. newUrl =   "<a href='" + this.getText() + "' target='_blank'>"
The OpenLaszlo Incubator (<<openLaszloInstall>>\lps\components\incubator) has several useful components and features for developing rich web applications. These include form validators, the rich text editor (Flash runtime only, not DHTML), and tool tips (the subject of this blog entry). This blog entry's example of applying an OpenLaszlo tooltip is trivial and is similar to those shown in the example in the OpenLaszlo blog entry Laszlo Mail Tooltip Contributed to OpenLaszlo and in the blog entry OpenLaszlo: Dynamic Tooltip Text. Here is a full example of OpenLaszlo code with a simple tooltip included. The above source code will not compile with the lzc compiler if the include statement is not specified. This is shown in the next screen snapshot with the message "Unknown tag: tooltip". With the include line <include href="incubator/tooltip/tooltip.lzx" /> included, the source code above does compile correctly. The next series of screen snapshots show the tooltips used in the code above in action. The first two screen snapshots show the tool tips that are provided initially for each button and the third screen snapshot demonstrates the changed tool tip for the main button based on the text entered in the input text field. All three screen snapshots above show the OpenLaszlo tooltip in an SWF8 runtime (now the default runtime in OpenLaszlo 4.1). Of course, OpenLaszlo's support for a DHTML runtime is a compelling feature for many developers. The next single screen snapshot shows the application running in DHTML. The image was captured after the inputtext field was changed to contain the contents "Dustin!". With the OpenLaszlo tooltip, it is possible to go back to the OpenLaszlo RSS Reader example and add tool tips to that reader. The next screen snapshot shows how this looks when one of the newly added tool tips is displayed. 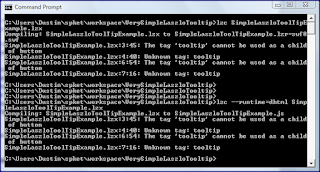 The OpenLaszlo tool tips are highly useful in providing additional detail to users. Fortunately, they are easy to add as well. In this blog entry, I will be demonstrating the development of a simple Model MBean. In a previous blog entry, I demonstrated some key characteristics of the MXBean. The MXBean is more straightforward to develop and use, but the additional complexity of the Model MBean does bring several benefits. The two primary benefits that I like to use Model MBeans to achieve are the increased descriptive nature of the Model MBean and the ability to "wrap" non-JMX classes or resources with the Model MBean. The latter advantage is the primary reason that the Spring Framework uses Model MBeans in its JMX support. The Model MBean enables Spring to allow developers to write plain Java classes that Spring can then expose as MBeans by "wrapping" the developed simple objects as managed resources. Spring also illustrates the descriptive nature of the Model MBean. Spring accomplishes this with annotation-based descriptive specification as I discussed in a previous blog entry. In short, the Spring Framework takes advantage of the two most important advantages (in my opinion) of the Model MBean by using them to wrap non-JMX objects and by leveraging their great descriptive ability. In the remainder of this blog entry, I will show the rather verbose code for handling Model MBeans by hand. 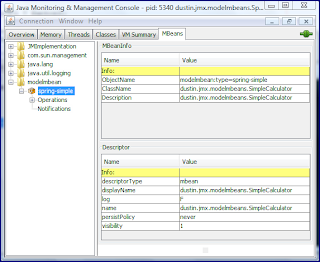 I'll also show the extra detail displayed in JConsole thanks to the Model MBean. The first code listing is for the plain Java class that has no knowledge of JMX or the fact that it will be managed. The next code listing is the Model MBean handling and registration. This is a rather long code listing, indicative of the verbosity of the Model MBean. Note that JMX books have provided frameworks and libraries to reduce this code and Daniel Fuchs shows in his blog entry Dynamic MBeans, Model MBeans, and POJOS... how one could use reflection to reduce Model MBean code. Even so, Model MBeans still require more tedious coding and can be a little more tricky than the Standard MBean or the MXBean. If a developer is using the Spring Framework in their application, then Spring's support of Model MBeans makes these particularly easy to apply. When not using Spring, one might consider the Apache Commons Modeler Component to support Model MBeans. With all that said, here is the code listing. * The purpose of this class is to demonstrate use of ModelMBeans in the raw. * operations and the operations' parameters. // Build the PARAMETERS and OPERATIONS meta information for "add". // Build the PARAMETERS and OPERATIONS meta information for "subtract". // Build the PARAMETERS and OPERATIONS meta information for "multiply". // Build the PARAMETERS and OPERATIONS meta information for "divide". * Set the provided ModelMBean to manage the SimpleCalculator resource. * Create a ModelMBean the "old fashioned" way. * @return ModelMBean created directly without framework. System.err.println(  "ERROR trying to create a ModelMBean:\n"
* @param modelMBean ModelMBean to be registered with the MBeanServer. * @param objectNameString ObjectName of the registered ModelMBean. System.err.println(  "ERROR trying to generate ObjectName based on "
System.err.println(  "ERROR due to ObjectName ["
+ objectNameString + "] already existing: "
System.err.println(  "ERROR trying to register MBean with ObjectName "
System.err.println(  "ERROR trying to register nonconforming MBean "
* Create a ModelMBean in the raw and register it with the MBeanServer. * Demonstate use of ModelMBean. 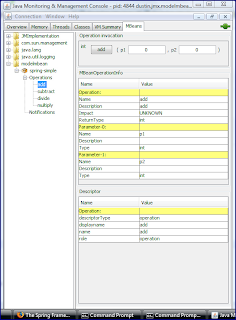 When the above code is run, the operations in SimpleCalculator can then be accessed via JConsole as shown in the next four images (click on images to see larger versions). The images demonstrate the descriptive information available for the MBean and for each operation thanks to the Model MBean's extraordinary descriptive abilities. They also show the results of one of the operations. I have attempted to demonstrate the power and flexibility of the ModelMBean. I did not show specification of the metadata for constructors, notifications, and attributes, but they generally follow the same pattern as shown for operations. ModelMBeans are another example of the typical trade-off of greater flexibility for increase complexity. However, there are ways to reduce this complexity as discussed previously. These include use of reflection, use of the Spring Framework, use of the Apache Commons Modeler Component, and use of JBoss XMBeans.